MADCO entertains, educates, and collaborates through innovative dance programming for communities across the nation so audiences don’t just watch dance, they experience it. 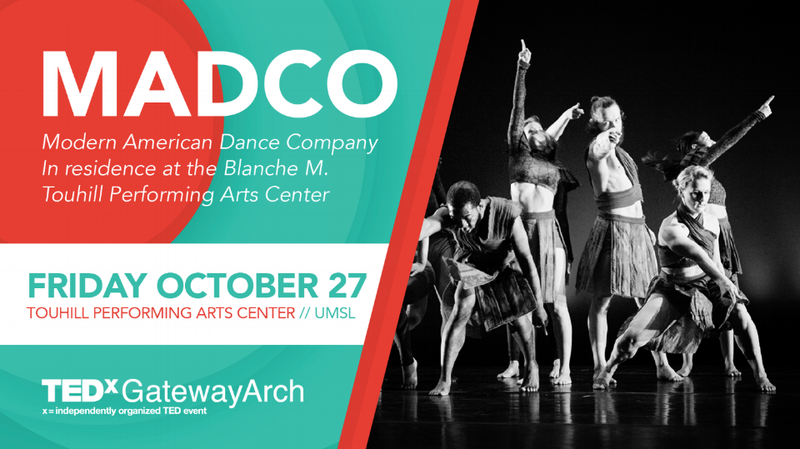 They are proud to be the professional dance company in residence at the Blanche M. Touhill Performing Arts Center on the campus of University of Missouri – St. Louis. The company reaches over 30,000 people annually and is known for its high energy, athleticism, and entertaining style that leaves audiences wanting more. Since 1976 we have promoted dance with touring concerts and educational programs throughout the United States. Under the Artistic Direction of Stacy West, MADCO has a commitment to collaborations and to commissioning work that makes an impact. Through groundbreaking choreography coupled with relevant education and community outreach, MADCO shares physical, honest, intellectual, and emotional communication with those who experience it. Sign up to get TEDxGatewayArch news, event announcements, stay in touch with our speakers, and community updates.